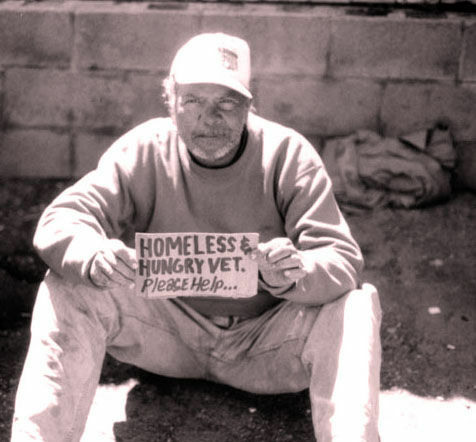 There are approximately 50,000 homeless veterans in the United States. Approx. 33% of homeless men in the U.S. are veterans. These are very depressing statistics and we as a nation owe it to our veterans to turn this around. We must insist that returning veterans are given every opportunity to receive medical care, job training, and first priority on jobs. Some folks find it difficult to understand why a Vet should get job priority? Simply put, because they deserve it. They stepped up, they put on the uniform, they went out on the battlefield, and they sacrificed for our freedom. They deserve it. We need to reach out and do all that we can to help. Donate money, volunteer time, write your representatives, whatever it takes. If you are not sure how, Google “Homeless Veteran” and a wealth of information will be provided. They did their part, now we need to do ours. It’s a sad thing, really. The average person just can not wrap their head around what a Veteran has faced in combat. I have to disagree with the idea of non-transferrable skills. Anyone that has served has learned leadership, discipline, how to work as a team and so much more. These skills may not directly transfer, but what they do transfer into is a person that is able to keep on going when others complain. Veterans are tough and can handle any situation. Teach them something, and they will be your best employee. After all, how hard is an office job to a Veteran, when they have slept and crawled in the mud, learned to sleep through gunfire, and learned to awaken into an intense alertness at a moments notice. It’s all about a change in mindset. These people should be given every opportunity. A free education should be mandatory.